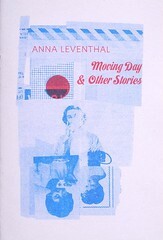 Montreal writer, radio producer, and performance artist Anna Leventhal has just published a limited-edition chapbook of three short stories–one of them new–with Paper Pusher Print Works, a Canadian micro-press that produces beautiful hand-made books, posters, and paper goods. Moving Day & Other Stories collects “Sweet Affliction” and “Last Man Standing”–first published, respectively, by Geist and Maisonneuve–and the previously unpublished “Moving Day,” an inventive satire of Quebec’s Fête du déménagement. These stories offer a taste of what’s in store for readers of Leventhal’s first full-length collection, Sweet Affliction, which is currently on submission in Canada and the United States.